Every year during the month of January the Pennsylvania Farm Show comes to Harrisburg and is held in the Farm Show Complex & Expo Center at 2300 North Cameron Street. People from all over the country flock to Harrisburg to participate and/or visit the PA Farm Show every year. This is one of the biggest attractions that central Pennsylvania has to offer. Parking can be a real nightmare so I highly suggest you visit their web site to learn where all of the parking lots are at and take the shuttle down to the complex & expo center. Parking can cost you $10.00 depending on where you park. If you have an official handicap parking placard, you can park right in front of the complex. If you are not taking the shuttle, please plan on doing a lot of walking to get inside the building. Once you are inside the main entrance you can go left or right and there is an information center right inside the door. I suggest you take the free program guide which includes a schedule of events and a nice map to help you navigate around the complex. If you need to use the restroom, now is a good time to do so, although you will find additional (smaller) restrooms sprinkled throughout. Typically we like to go during the weekday hours as it is less crowded during those times. However, this year we were brave and went on a Sunday. Oh my gosh, it was packed with wall-to-wall people and parking was a nightmare! Next year, we are going back to our weekday schedule because it was so packed that we missed half of the things we wanted to see and we were there for over four hours! The arenas, show rooms and halls are all broken down into the type of animals that are being displayed. While going from one area to another you can see horses, cows, steers, sheep, goats, lambs, alpacas, ducks, chickens, geese, turkey and all kinds of other wildlife that is farmed in the great state of Pennsylvania. At any given time you can find various judging competitions going on in the arenas. At the time we were there we got to see a steer and cow competition going on which was really interesting to see. I was pretty happy that this arena wasn't packed and we were able to sit as a family and watch some of the judging activities. When bringing the kids to the PA. Farm Show one of the many things that the kids enjoy doing is taking a ride on the beautiful Farm Show Carousel (the Merry-Go-Round) which costs $2.00 per person. The line can be long at times but the line goes pretty fast. My grand daughter only stood in line for 15 minutes which we thought was pretty good. When you are walking around you will find many areas where the kids can stop to pet the various animals. During the afternoon that we were there, my grand daughter got to pet a cow, horse, alpaca, duck and a bunny rabbit. So, if the kids like visiting petting zoos, they would definitely enjoy this experience! The food court is always packed but visiting it is well worth it! You can buy delicious baked potatoes, pork sandwiches, the famous Farm Show milkshakes, cotton candy, beef jerky, maple syrup, honey, fresh PA. grown produce, soft pretzels, hot dogs, pork sausages, candy, desserts and all kinds of other things!!! When visiting, we highly recommend the milkshakes and the baked potatoes...delicious!!! While visiting the food court area you will want to head down to see the famous Pennsylvania Farm Show Butter Sculpture. 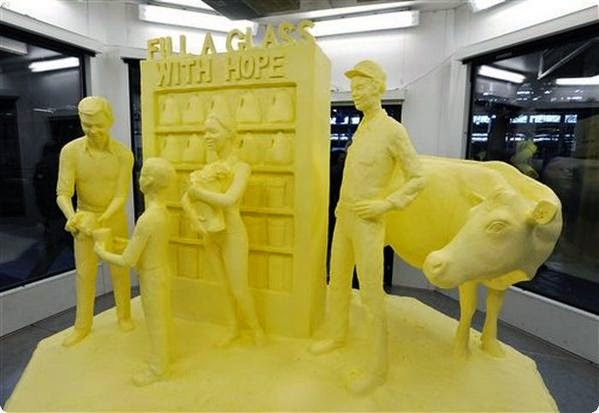 The theme for this year's butter sculpture was titled "Fill A Glass With Hope". It was made using 1,100 pounds of butter and is housed in a glass paneled refrigerator unit. This allows visitors to walk around it and see it from different angles. The butter scene is to honor the local area food banks that help to feed the hungry. In the scene you will see a male food bank worker preparing a glass of milk for the little boy as his mother looks on while holding a bag of groceries. Standing off to the side is the Pennsylvania farmer and his dairy cow that made it all possible. Very cool. Every year there is a new butter sculpture on display. In the Food Court area you will find all kinds of Pennsylvania grown fresh produce on display. Every year they hold competitions that are judge by experts to pick out the best apples, garlic, pumpkins, squash, tastiest nuts and all kinds of other PA grown produce items. Since I love to cook and bake...I love sitting down and watching a few of the many cooking demonstrations that they have to offer. They will show you how to prepare certain recipes, talk to you about the ingredients going into them and share with you all kinds of valuable cooking tips that you can use when you get home. Love these demos! Visiting the annual Pennsylvania Farm Show is an activity that my family looks forward to doing every year when the PA. Farm Show is in town. If you are ever in the area or can spring for a little road trip, we highly recommend that you visit. You can learn more by visiting the Pennsylvania Farm Show official site online.